I'm starting to wonder if I'll be able to successfully finish this year's reading challenge. I just keep piling on more and more things and my available time for reading keeps shrinking and shrinking. First I was lost, drifting, and unemployed, reading books left and right. But then I started working full-time. I also decided to learn Spanish, to help me in my quest of becoming a firefighter. And now I've just signed up for an EMT class for the summer. It starts tomorrow and is on Tuesdays, Wednesdays, and Thursday from 6-10pm. After commuting home that leaves me no time for anything and very little sleep as well. I also have to fit working out in there somewhere--sadly but definitely a higher priority than reading. But at least I've got the weekends free. So I'm guessing my output may start to diminish even more, although I will keep reading whenever I get the chance. "To all those who lead monotonous lives in the hope that they may experience at second hand the delights and dangers of adventure." Agatha Christie is pretty famous. I remember seeing shelves full of her books at the library when I was a kid. I feel like I've always been aware of her books, but I've never gotten around to reading them. Because I've recently been looking specifically for books written by women, I decided it was finally time to read some Agatha Christie. So, I picked up The Secret Adversary (1922) for my first exploration into Christie on the advice of some Pajiba commenters. I was half expecting something old-fashioned and perhaps a little slow, but I was pleasantly surprised by a good mystery, fast-paced plotting, and fun dialogue. The protagonists in The Secret Adversary are two young people (early 20's? ), Thomas Beresford and Prudence Cowley--who goes by Tuppence. They are old childhood friends who get together in London after World War I. Both are poor and jobless, and they decide to start a business venture. One thing leads to another and they are suddenly on the trail of a missing, young woman named Jane Finn who may know where some very important papers are. They are foiled at every turn by a mysterious Mr. Brown who often seems omniscient and incredibly powerful. However, after joining up with Jane Finn's cousin, finding a number of other allies, and risking their lives a number of times, they solve the mystery, save the country, and every one ends up happily ever after--except for the bad guys. There was something decidedly unrealistic and theatrical about this book. The coincidences are extreme, the characters find information at exactly the right moment, somehow survive situations where they would end up dead in the real world, and enjoy an unbelievable amount of good luck. However, none of this lack of realism really hurt the novel. It's fun and adventurous, the main characters are interesting and likable, the plot moves steadily along, and the dialogue--especially between Thomas and Tuppence--is quick and entertaining. I guessed pretty early on in the novel the crux of the mystery, but I was never sure and continued to second-guess myself until the end. 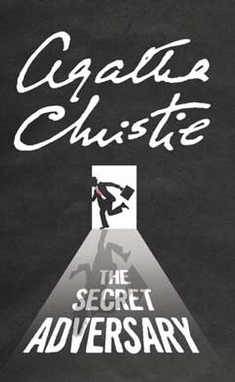 Something of a light, entertaining read, but all in all an enjoyable one, and I'm sure I'll be reading more of Agatha Christie's books in the future.